Is This Where Puget Sound Starts? Tammy Yee is the author/illustrator of more than 24 children's books set in the Hawaiian Islands. I feel very fortunate to have had the opportunity to interview Tammy about her projects and what she enjoys most about being an author and illustrator. You can read more about Tammy and her many projects at tammyyee.com. You've written and illustrated a number of books. Do you have a preference for either writing or illustrating? I love both writing and illustrating. I tend to be very visual as I create--a book develops like a movie or a storyboard in my mind, with different parts of my brain toggling on and off. As a writer, I begin with a blank canvas that I must fill with interesting characters and a fresh, compelling story. As an illustrator, I'm given a story and I must create a visual world that doesn't merely interpret, but adds to that story. Because writing is more intellectually and creatively challenging, it can be tempestuous. Because illustrating (32 pages of art) is more physically challenging, it can be arduous. Both are just as gratifying. Video featuring my dear friend, fisheries biologist and author Ron Hirschi. We've worked on a number of projects together (Including "Swimming with Humuhumu" and work for the Trust for Public Land in Puget Sound), and I have never met a more genuine, dedicated, and tireless conservationist. We're always scheming together. The sketch in the beginning of the video is something he and I are working on. Visit Ron's website for more information about his books, school visits and stream conservation projects. 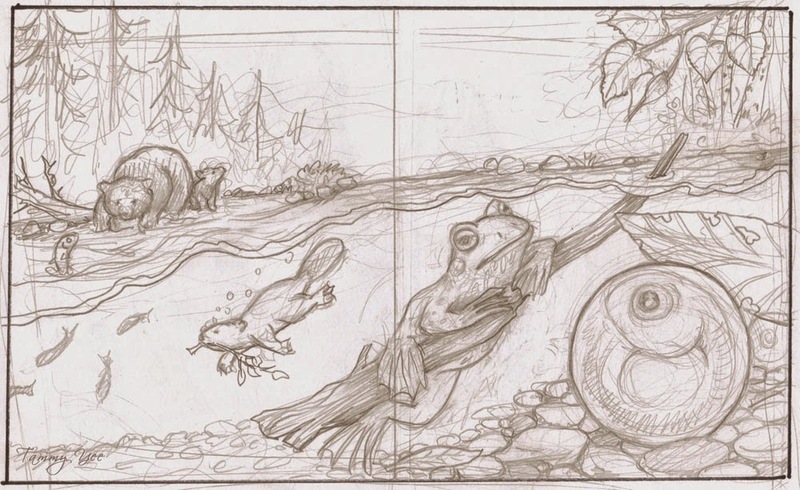 You can also learn about Puget Sound ecosystems and download coloring pages! Looking forward to creating more sketches for his next project. Mahalo, Ron! Is This Where Puget Sound Starts? from John F. Williams on Vimeo.